This post is in collaboration with and sponsored by Mikel Kristi. One of the most memorable days during my college career, was getting a skincare assessment. For some reason, I assumed my skin was in tip top shape because I was young and I washed my skin every few days. Yes, every FEW days. Luckily, that aesthetician gave me a cold hard reality check one day. We went into a dark room, and she did the sun damage test to find that my skin was completely ruined. Blasted. I mean it was just not even remotely healthy. All this time, I had thought I was doing an “okay” job and I didn’t need to do much, but it was clear I needed to put 100% more effort given it was a half-assed attempt at that point. Fast forward 10 years, and here I am walking into Skin Appeal here in Tucson Arizona. The receptionist greets me kindly and hands me a form to fill out. After I finish the paperwork, we go into a dark room to take photos of my face. Here I am again TEN years later thinking my skin is in great shape minus the acne 100% caused by my marathon training. I mean sweating for hours would affect anyone's skin, right? Reflecting back on this, how have I not learned from my last experience doing a consult like this? After taking the photos of my skin, we go into my room and wait for Christy Hall to come assess the damage and give me her recommendation long-term for my skin. I’d been waiting to meet her, and get educated because one of her favorite elements to the beauty industry is educating people. When I spoke with her on the phone, she wanted to educate me immediately. It’s not always about doing something to a patient. It’s about educating them so they can in fact, take care of their own skin. Most of us are not aware of the basics of skincare (trust me; I was schooled significantly and I had considered myself an expert.) There's also so much propaganda and misinformation in the beauty industry. I like to call them myths so let's dive into these so I can educate all of us. 1. You have normal, oily, dry or combination skin. This is one of the biggest misconceptions of skincare. Christy explained to me that no single person has a specific skin type for the long-term. We are all given the same skin. However, something happens along the way that changes our skin. Whether it’s lack of care for the skin, dry climate, extremely humid climate. Too much greasy food, not cleansing the skin, etc. leads to a certain issue. Just because I had greasy and oily skin in the 8th grade, does not mean I should still be using a skincare line for oily skin today. Likely, my skin is dry now after using years of that oily skincare line and I need a change. Before you choose a product line for the 5th time for “oily” skin, talk to a dermatologist or skincare professional in order to get to the root of the problem and finally fix the skin for good. 2. Mineral makeup is healthy. Let’s be clear here. Minerals are usually better for the skin, especially when it comes to makeup. However, a lot of mineral makeup brands claim to be mineral, but in fact they mix minerals with a lot of chemicals to the point it’s no longer just minerals. The FDA does not regulate the percentage of mineral to other ingredients that are not mineral, so a brand can claim to be mineral but you need to read the ingredients to be 100% sure. There may be some minerals, but if the product is mainly chemicals, then you're being fooled. 3. You need 91232392 skincare products daily. On the contrary, Christy’s goal is to get her patients to 0 products. Yep, you heard it right. She has her own skincare line (Mikel Kristi) but her goal is to have people use the products until their skin can take care of itself and no longer needs multiple products every day. Not to mention, get the skin to a place where it does not need heavy makeup. She does not wear any make-up other than eye liner, mascara and eyeshadow and her skin looks incredible. This is one of the reasons I knew I was going to listen to everything she told me. You have to see something in action to believe it; at least I’m one of those people who needs proof. 4. Eye creams help crows feet and dark circles. This one blew me away, because I have believed that an eye cream is essential to getting that darkness under the eyes as well as minimizing the crows feet. Sadly eye creams are attempting to combat problems that are usually UNDER the skin (they are usually not on the surface) and therefore, they are utterly useless. If your eyes are hollow, your eye will be darker naturally because a shadow will be cast on them. Especially in photos. Using an eye cream is not going to bring your eyes forward. This requires a bit more work, and likely some filler under the eyes. Once crows feet are prominent on the side of the eyes, it’s going to be near impossible to revert them with product. This requires work that stretches the skin on the outside, or minor laser treatment. All of this information helps me realize that marketing in the beauty world has genuinely fooled ME for years. Considering I have tried so many products (some amazing and some total flops) my eyes are more open than ever to smell out misinformation. I always had a feeling eye creams weren’t effective as they don’t do anything for me specifically, but they are more proactive than reactive. With the proper amount of education, we can all understand more about our skin which is a HUGE part of our bodies. It’s the biggest organ on all of us, and the face is usually the first thing others see on us. 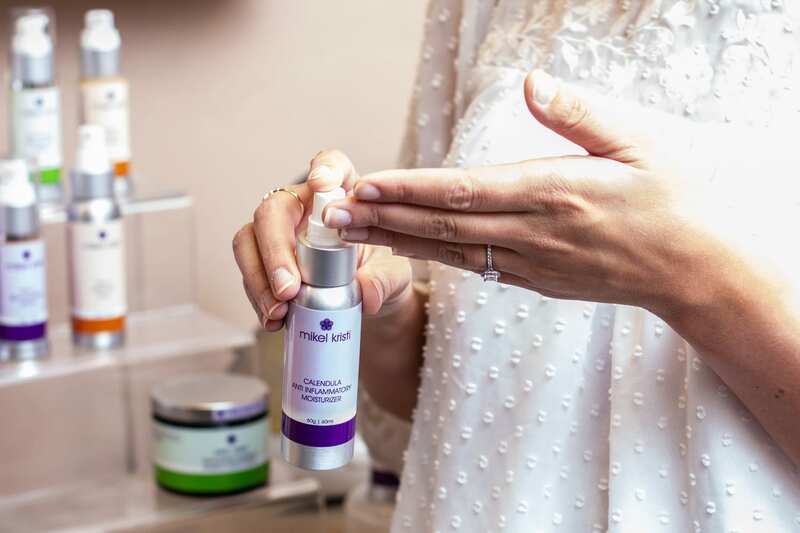 I appreciate the Mikel Kristi skincare brand so much, given my skin has improved and I don't require the use of all the products every single day which is 100% the goal of the brand. This is ideal for the long-term because your skin shouldn't have to rely on it. It's a total win, win and I can't recommend the line enough. Have you believed these myths for years? What skincare questions do you have?